All eyes now turned to Washington D.C., and Boston, Massachusetts later that day…. Mustafa: First, When you discovered that your area was getting an anomaly, how did your faction plan for it? Joe: I recall that my Sr agents in our DMV team notified and communicated to our local community of the DC event. Pedro: We pooled together the resources of the DMV area & as far north as my area (PA). We began discussing strategy & didn’t really have much experience overall, so it was very rough. A lot of people got their initial experience with anomalies in DC. Mustafa: Second, At what point did you feel like the ENL could gain the upper hand? Pedro: I felt like we had a strong plan going in and wasn’t sure the ENL had much. Until their BAF went up. Mustafa: So when the BAF went up is that when you began to fear a ENL comeback? Pedro: That was when I felt like we were losing the upper hand. I had confidence in the team to pull out a win. 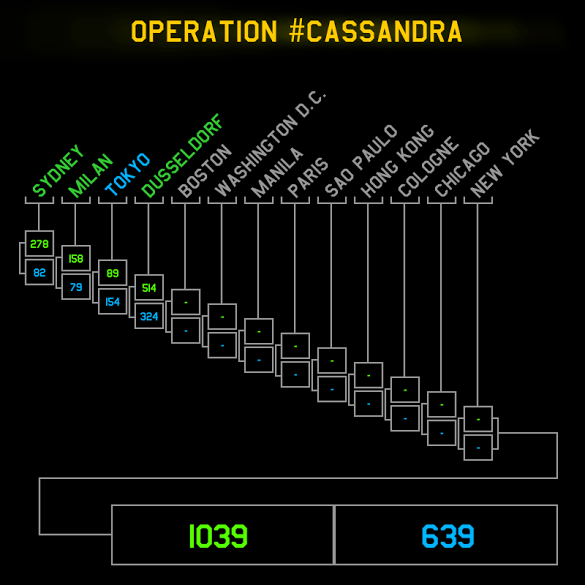 Cassandra DC we felt confident in our planning, tactics and organizational approach. But back then close to DC was ENL strong. We were true resistance back then. So we always had great respect for the ENL DMV and never thought that they were underdogs. But we knew the game has to be played, and that would dictate who won. 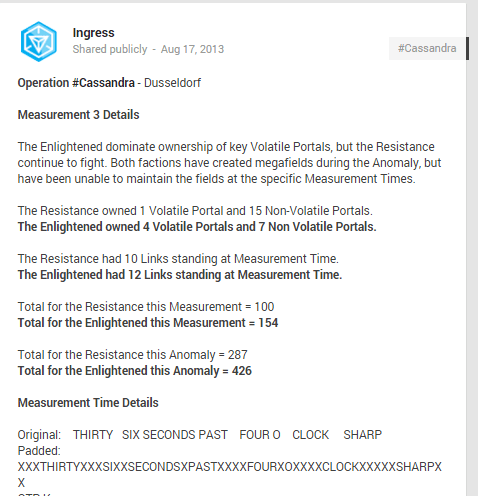 Prior to the DC event, the prior Cassandra events had the E having an advantage in the series prior to the DC event. If I recall properly during the event however. The measurement one large field by the E did cause some concern, but we rallied even more so the remaining measurement. I was in charge of the mobile team strategy to handle fields for the DMV Resistance. Mustafa: Good, good. Okay so the third one is: What are your overall thoughts that you took away from the anomaly? My thought was that we did good, but we had work to do if we wanted to keep it up. Joe: Overall thoughts: DMV Resistance can and did rally together when we need to (our first time really understanding that IMO), no matter the circumstances of how the regional play is prior to the event you do have a chance of winning — you play to determine who will win, and lastly Anomalies are a blast to coordinate and play in! Mustafa: Okay, final question. What do you think Cassandra was about? Pedro: As far as story line? I honestly don’t pay much attention to the story so I couldn’t say. For me it was about getting together with the people I’ve networked with on the east coast. Joe: For the storyline, control of the global power centers (economic, political, etc). From Niantic perspective, their baby steps in learning how to handle global scale events (operational from many perspectives, marketing efforts, etc). 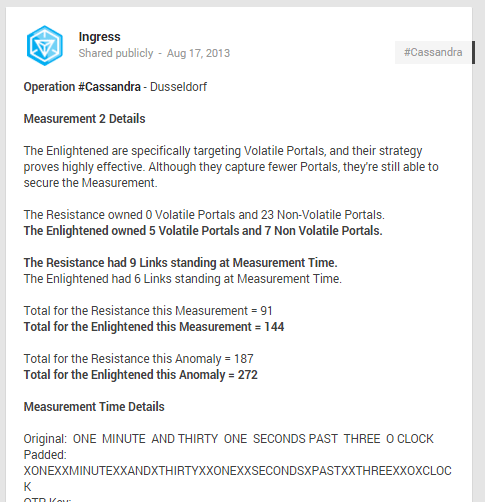 And with that, the start of the second and final week of #Cassandra Anomalies began. The Enlightened surged to claim the early day but it was the Resistance who kept the nation’s capital Blue…. 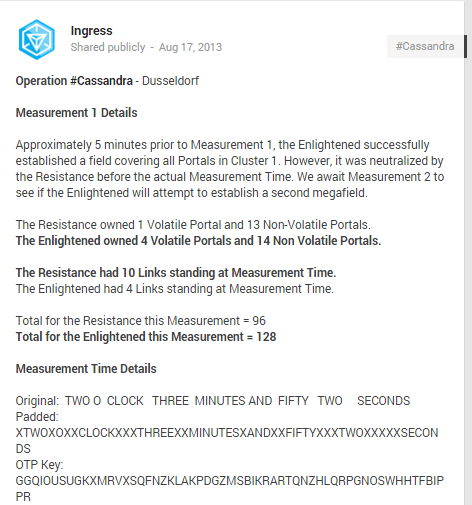 Tune into DeCode Ingress later this week for more information about what happened next in Niantic History!